Chinchillas are rodents, belonging to the family Chinchillidae. Because of their high energy, chinchillas are not ideal pets for young children. However, chinchillas are friendly, odorless and quiet animals that learn to recognize their owners primarily by smell. Chinchillas are mostly nocturnal animals, but may be quite active during the day. Adult chinchillas may be housed together, but the cage must be large enough and a "getting acquainted" period is advised. Male chinchillas should be neutered so they can be housed with females or other neutered males. Chinchillas are fast and agile animals and should get at least 30 minutes of exercise and play daily. A daily "dust bath" should be offered and combing chinchillas will help rid them of excess hair during a shed. 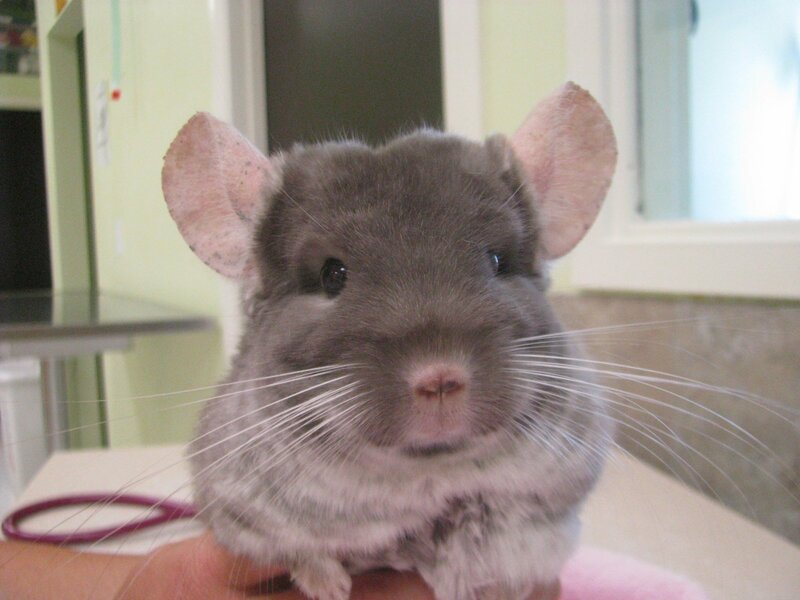 DIET: A commercial chinchilla pellet, with 16-20% protein and 15-35% fiber should be available free choice. Adult chinchillas do particularly well on a higher fiber, timothy based pellet such as Oxbow’s Chinchilla Deluxe®. Provide an unlimited amount of timothy or other non-legume grass hays, such as brome, oat, meadow or orchard grass. As well as the psychological benefits of providing hay for foraging, the grass hays provide needed fiber to the diet and help to wear down the chinchilla’s continually growing teeth. Alfalfa hay is not recommended; as a legume, it is too high in calcium, protein and calories to be fed daily. Treats should be offered sparingly, with the total daily amount not exceeding 1 teaspoon or 10% of the total diet per adult. Suitable treats include seeds and nuts, dried fruits, and very small amounts of fresh green leaf vegetables or carrot. Raisins and sunflower seeds are often favourites, but too many will lead to obesity, dental disease and digestive upset. Fresh clean water should be available at all times. Chinchillas fed pelleted food do not need a vitamin or mineral supplement. Avoid sudden diet changes and be consistent with the food being offered to avoid digestive tract upsets. Until 5-6 months of age, the chinchilla should be fed pellets, hay, and water after which fresh foods and treats can slowly be introduced. HOUSING: A large multi-level cage is preferred for chinchillas, preferably no less than 4 feet x 3 feet x 3 feet for a single chinchilla. Chinchillas tend to be very active and are natural jumpers, so the larger the cage the better. 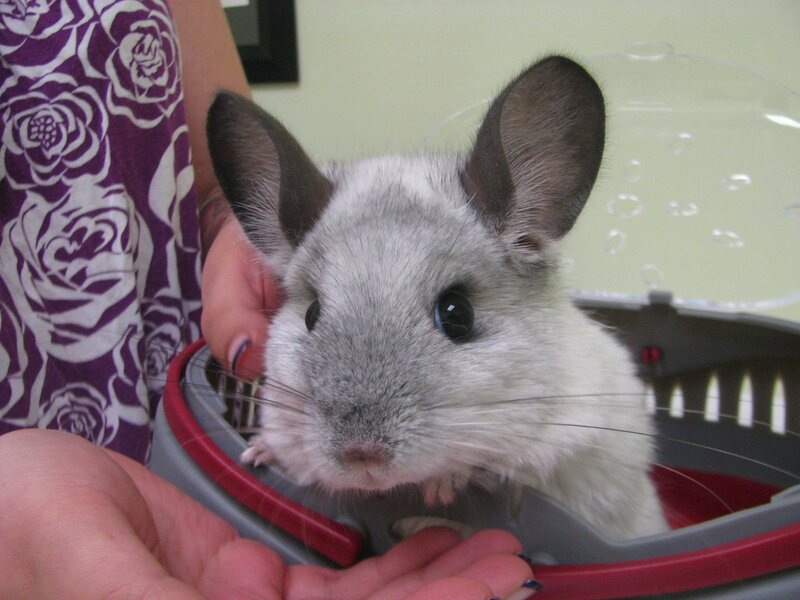 Chinchillas will often chew at the cage bars, so avoid plastic coated or zinc based wire. To protect the feet from injuries on mesh or hard plastic flooring, provide sea grass or timothy mats for the chinchilla to stand on. Aspen shavings or paper products provide a suitable bedding material and should be changed frequently, according to the cage size and number of chinchillas housed. Avoid corncob or scented wood chips such as cedar or pine, as they can predispose the chinchilla to disease. Chinchillas enjoy climbing and jumping, so branches or platforms in the cage increase exercise and enrich the environment. Wooden branches, wooden blocks, hay toys, tunnels, bungalows or mats and commercial chinchilla toys all provide chewing entertainment. A nest box should be provided for sleeping. 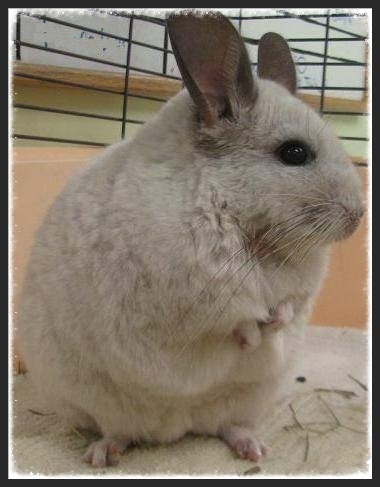 Chinchillas need to clean their fur at least once or twice a week to maintain a healthy coat. This is achieved by rolling in dust. Commercial dust baths are typically a fine volcanic ash and should be offered in a box or an enclosed container (many owners use large jars) to prevent too much dust accumulation in the cage. Remove the dust bath after use to prevent the chinchilla from over dusting and possible eye problems. Bathing in water is never recommended. Chinchillas are prone to pneumonia if placed in a drafty or humid area and most certainly will develop heat stroke if put in direct sunlight or too hot a room; ideal temperatures ranges from 60 – 70°F (16 – 20°C), with less than 40% relative humidity. PHYSIOLOGY: Chinchillas live an average of 8 – 10 years, but can live up to 18. Sexual maturity is reached at 7 - 10 months of age. Gestation length is 105 – 115 days and there are 1-5 young per litter. Chinchillas wean at 6 - 8 weeks of age. HANDLING: Never grab a chinchilla by the fur, as a handful may come out in what is called "fur slip". Holding a chinchilla by the base of the tail while supporting the body with the opposite hand is the best way to carry your pet. Chinchillas like to be rubbed under the chin or behind the ears. They rarely bite, but will vocalize and ‘bark’ or spray urine if upset. COMMON PROBLEMS: Chinchillas are prone to intestinal problems, calcium deficiencies that may cause seizures, teeth problems, bacterial infections, ringworm, and pneumonia. Any signs of drooling, lack of eating or energy, hair loss, crustiness around the eyes, ears, or nose, or diarrhea warrant a veterinary visit right away. Chinchillas are particularly sensitive to temperature extremes and stress and can develop behavioural problems such as fur chewing or ‘barbering’. Every pet chinchilla should visit an veterinarian experienced in chinchilla care once a year to aid in early detection of problems and to allow a chance to update owners on the latest in care and husbandry. THIS INFORMATION IS MEANT AS A GUIDELINE ONLY AND IN NO WAY REPLACES CONSULTATION WITH A VETERINARIAN.